During the promotion period, PNB UnionPay cardholders will received one complimentary travel size 80 ml shampoo, one 75 ml mask and one travel pouch with any single-receipt purchase of PHP 5,000.00. 1. 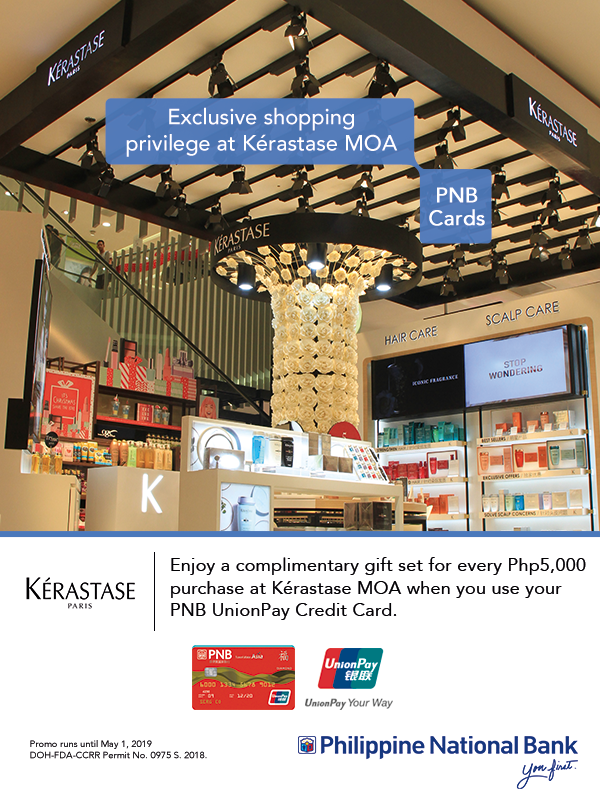 Get up to 3 complimentary travel size gift sets for every PHP 5,000.00 spent per PNB UnionPay card per day. 2. This promotion is not valid for accumulated receipts. 3. To enjoy the privileges, please present your PNB UnionPay card prior to payment and transaction has to go through PNB UnionPay networks. 4. This offer is only applicable at Kerastase counter in Mall of Asia Department Store. 5. This offer is not convertible to cash. 6. This offer is not valid for other on-going promotions, discounts, vouchers, etc. unless otherwise specified. 7. Complimentary gift is subject to a first-come, first-served basis, available while stocks last. 8. Other terms and conditions may apply, please check in-store for more details. 9. Loreal Philippines Inc. and UnionPay International reserve the right to amend the terms and conditions without prior notice. 10. In case of any dispute, the decision of Loreal Philippines Inc. and UnionPay International shall be final. 1. A cardholder shall present his/ her PNB UnionPay card and pay his/ her bill using PNB UnionPay card before he/ she can enjoy relevant offers. 3. UnionPay International and the merchant reserve the right to cancel, revise, suspend or terminate all or any parts of the promotion, or revise the terms and conditions herein contained, at any time without prior notice or reason. In case any disputes, the decision of UnionPay International and the merchant shall be final and binding on all parties concerned.